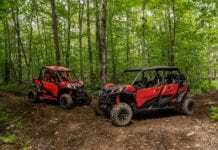 The flagship 2017 Can-Am Maverick X3 Max family of side-by-side vehicles benefit from their defiant, precise and powerful heritage, and are engineered to reshape the multi-passenger market by delivering bold new levels of comfort, convenience and design. The new four-up king of the super sport segment of side-by-side vehicle market is equipped with a best-in-class, high-performance TTX suspension with recalibrated FOX shocks for an optimal off-road riding experience. 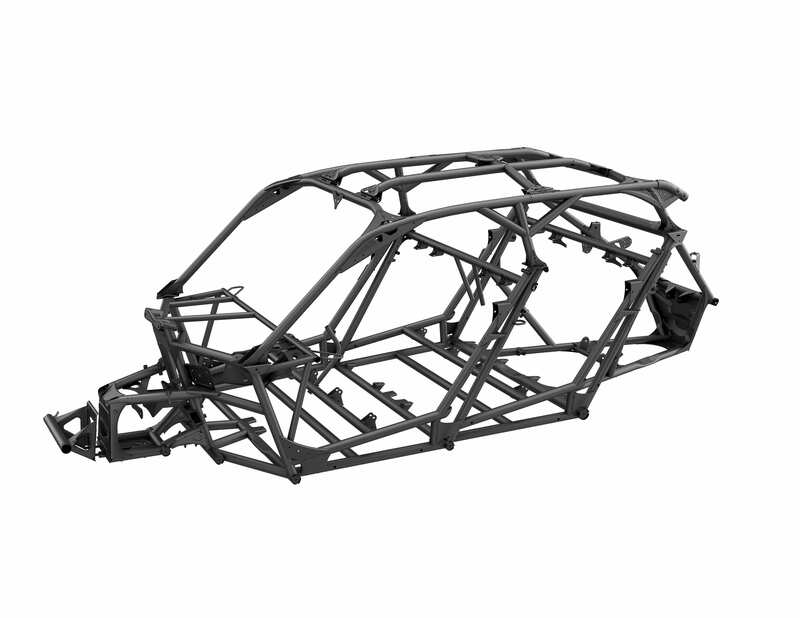 A fully welded, high-rigidity steel chassis is ultra durable and longer than its closest competitor. 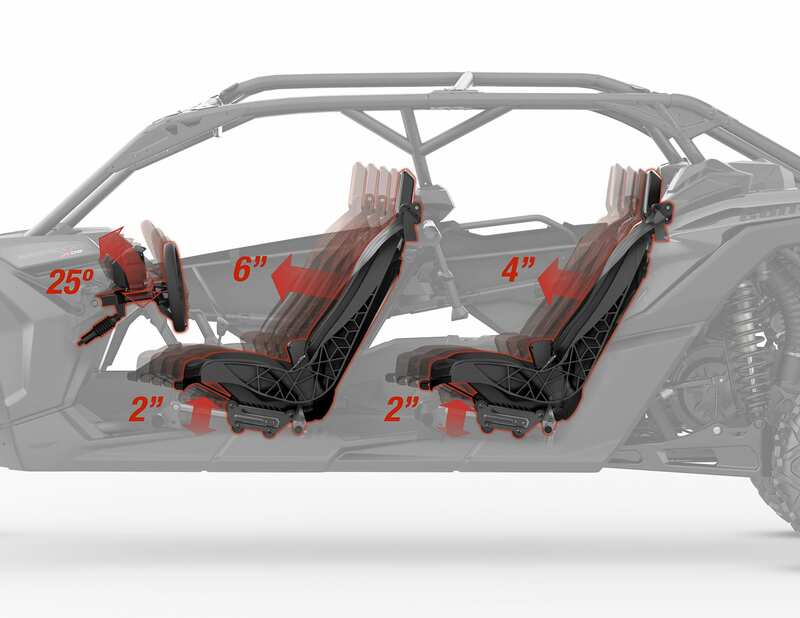 Rear passenger ergonomics are taken to maximum levels, as the rear Ergoprint seats sit on the same level as the front seats and offer unsurpassed four-way adjustability and more seat pitch than the competition. Strategically positioned performance footrests, grab bars and new levels of roominess in the Ergo-Lok cockpit, as well as a wheelbase that is 15% longer than the competition, enhance the riding experience for rear occupants. 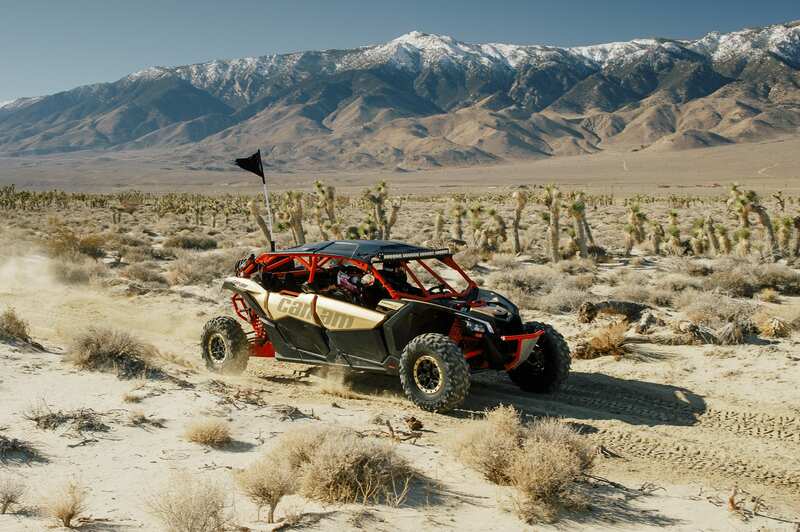 The Maverick X3 MAX side-by-side vehicle equally fuses its ultimate power, precision handling and astounding comfort levels to create a dynamic new riding experience that includes top-of-the-line styling to rise above the crowded field. 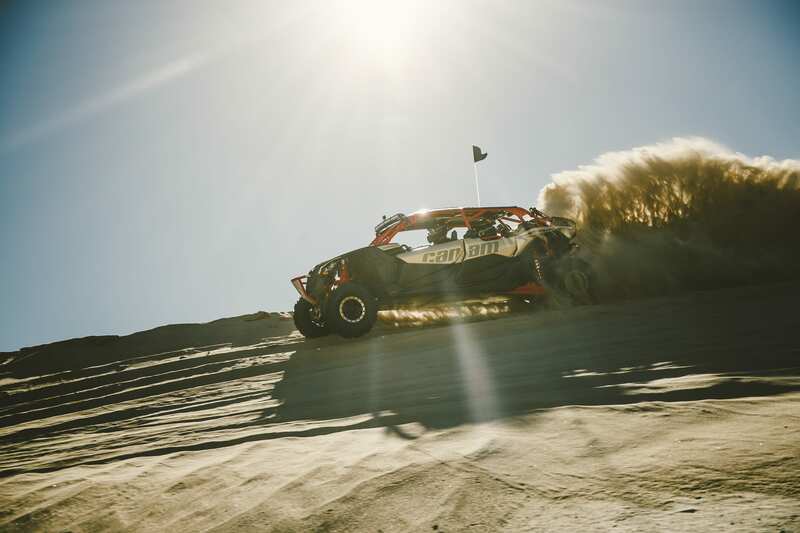 The Maverick X3 MAX side-by-side vehicle is available in three different packages: the Maverick X3 MAX Turbo R, the Maverick X3 MAX X ds Turbo R and the wider Maverick X3 MAX X rs Turbo R. The new Maverick X3 MAX side-by-side vehicle is defiant, precise and powerful, reinforcing even more the leadership of Can-Am in the super sport segment. 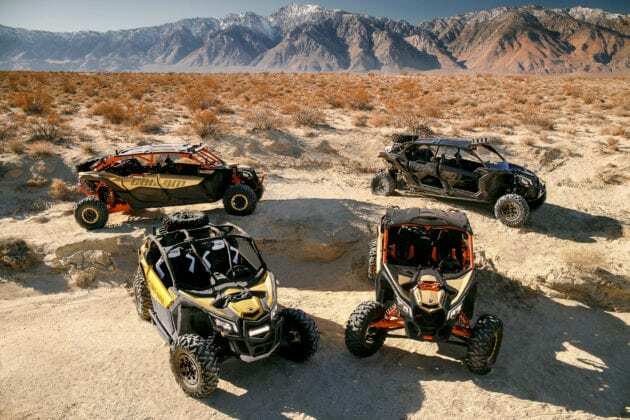 The Can-Am Maverick X3 MAX side-by-side vehicle boldly carries the same remarkable, core Can-Am DNA and character introduced with the two-seat Maverick X3 family, but separates itself from the multi-passenger crowd with an unprecedented package. Front to rear, driver to passengers, the X3 MAX is designed so the occupants feel connected to its every move. 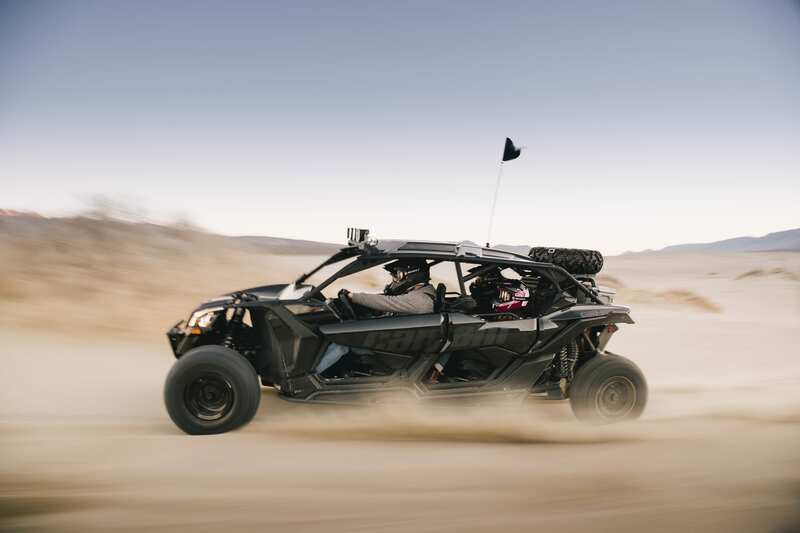 The Maverick X3 MAX side-by-side vehicle is comfortable and intuitive, inspiring confidence directly to the driver and all three of its passengers. The Can-Am Maverick X3 MAX side-by-side vehicle provides a rush of adrenaline the instant you see it with its more spacious design. Its innovative comfort levels only heighten the overall experience, whether you’re the driver or a passenger. An ideal mix of performance-driven mechanical and structural design takes its wild intensity to new levels. Can-Am engineers continued to push the design envelope when building the most modern four-up side-by-side vehicle in the industry. In form and function, the Maverick X3 MAX vehicles have a substantial edge over the competition. A revolutionary design focuses squarely on the driver and multiple passengers and how they all become one with the vehicle. Front to back, the Maverick X3 MAX family of side-by-side vehicles offers a superior fit and finish and head-turning visual appeal. It starts up front with signature LEDs and a distinctive Can-Am family appearance, and then moves through the advanced, spacious four-seat cockpit all the way to the aggressive and energetic rear end. There are multiple color options for the Can-Am Maverick X3 MAX side-by-side vehicle, so owners can select a color choice that best fits their attitude. The Maverick X3 MAX Turbo R comes in white, while the Maverick X3 MAX X ds Turbo R comes in painted Circuit Yellow or painted Triple Black. The top-of-the-line Maverick X3 MAX X rs Turbo R is offered in unique, painted Gold and Can-Am Red and also the popular painted Triple Black finish. The Can-Am Maverick X3 MAX side-by-side vehicle has a low seating position that encapsulates both driver and its three passengers so they feel at one with the vehicle and connected to its every move. This bold configuration allows the driver to quickly interpret vehicle attitude and react to maximize performance. The in-cabin experience is heightened with four-way adjustable, same-level seating for all four occupants. The Maverick X3 MAX features superior ground clearance (up to 14 inches) to accommodate varying conditions such as deserts, dunes, rocks or challenging trails. Its high and dominant posture ensures optimal off-road capabilities with no compromise to line of sight. 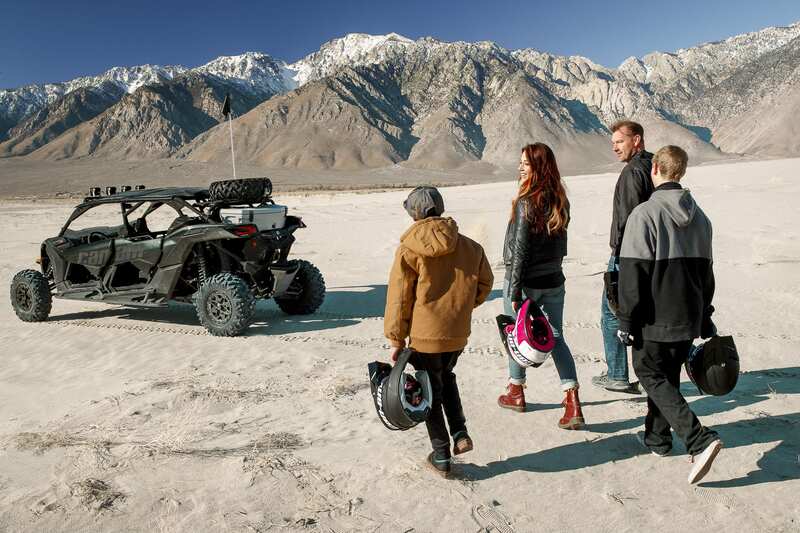 Visibility is critical for performance driving, which is why the Can-Am Maverick X3 MAX side-by-side vehicle is designed with a smooth line of sight and adjustable seating to create an optimized field of vision for the four occupants. 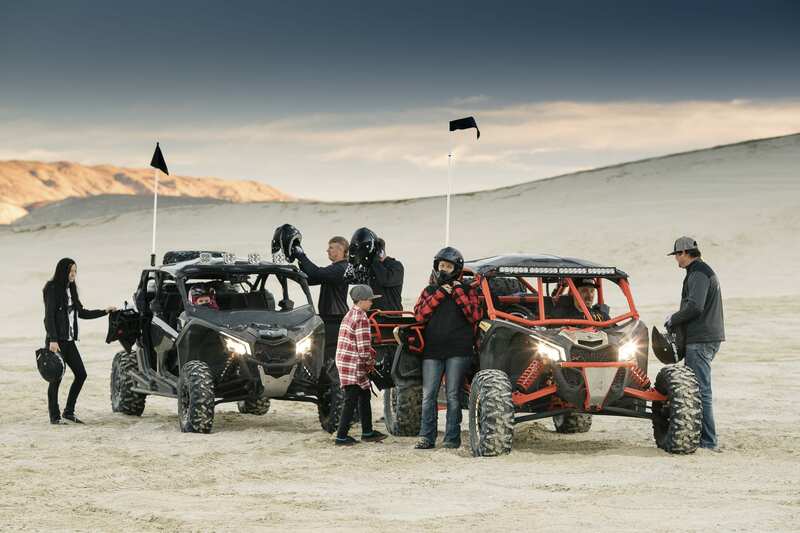 The Can-Am Maverick X3 MAX side-by-side vehicle has everything in the right place with easy-to-access controls. The race-inspired, flat-bottom (D-shaped) steering wheel tilts up to 25 degrees and has an integrated gauge for optimal visibility at any angle. A panoramic mirror provides excellent rear visibility to see other drivers lagging behind. The multifunction analog / digital gauge includes a speedometer, tachometer, odometer, trip and hour meters, fuel, gear position, sport mode, ECO™ mode, seat belt and 4×4 indicator, diagnostics, clock and auto shut off. 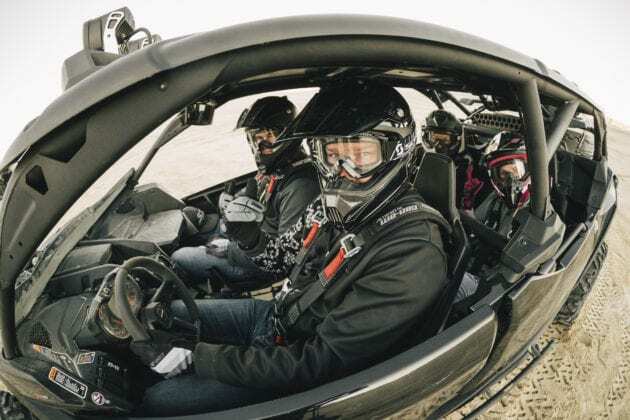 Once inside the cockpit of the Can-Am Maverick X3 MAX side-by-side vehicle, mechanical elements are strategically positioned to enhance the dynamic performance, seamlessly connecting the passengers to the vehicle. The clever and purpose-built interior provides naturally positioned front and rear passenger grab bars, strategically placed, angled footrests for all occupants and the most spacious rear seating in the super sport segment. The driver benefits from the sports car-like centered accelerator and brake pedals. 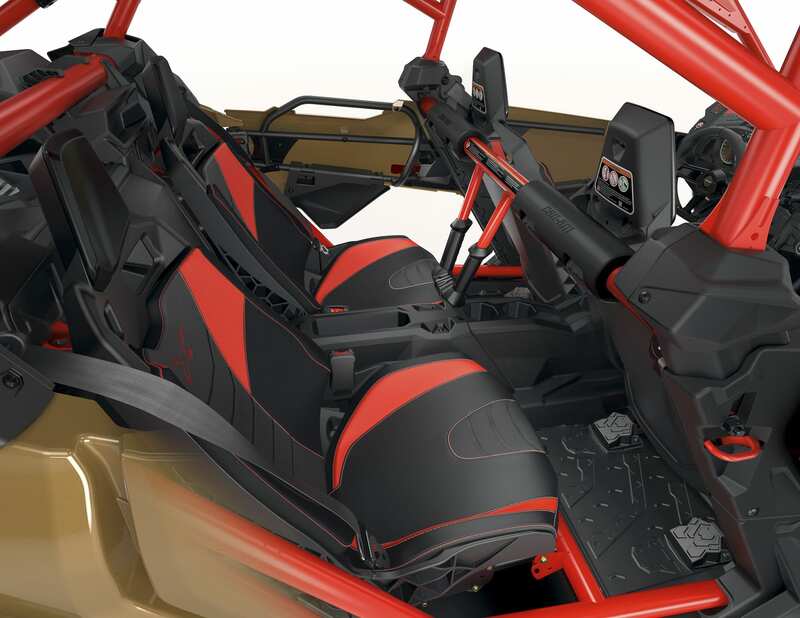 The Can-Am Maverick X3 MAX side-by-side vehicle features four occupant-focused, rally car-like seats for optimal positioning and ergonomics. All four seats are placed on the same level, to improve feel and fitment. Its unique front and rear ErgoPrint seats equally balance support and weight distribution, providing excellent comfort and bump absorption. Up front, the one-piece molded seats are four-way adjustable – 2 inches (5.1 cm) in height and 6 inches (15.2 cm) in forward-rearward slide. The rear four-way adjustable seats supply 2 inches (5.1 cm) in height and 4 inches (10.16 cm) in forward-rearward slide. All the seats sit on mud-proof supports and have removable cushions for easy cleaning. The rear seats supply 18% more seat pitch than the competition, providing additional space to the passengers. 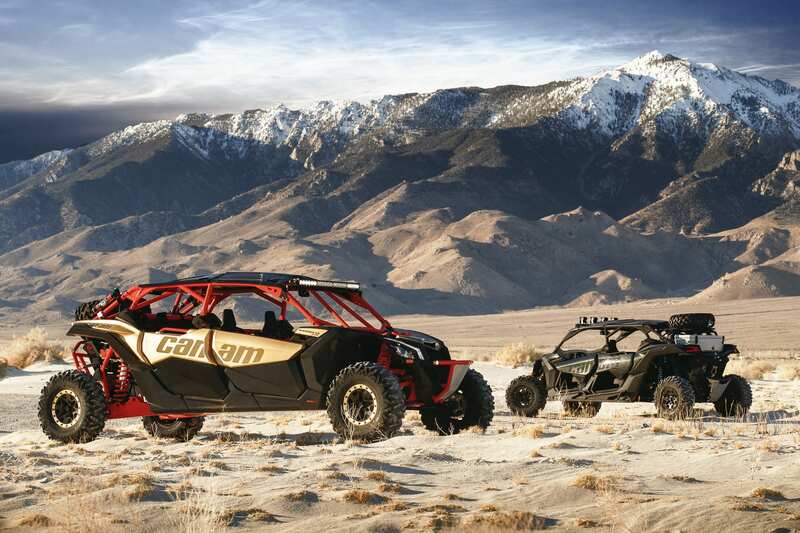 The Can-Am Maverick X3 MAX side-by-side vehicle is extremely easy to accessorize. The vehicle is 4-point or 5-point harness ready and features an integrated wiring channel and ground post to simplify electronics installation. Owners can also customize their Can-Am vehicle with door fillers, roofs, dashboard items and other accessories. The Can-Am Maverick X3 MAX features a best-in-class high-performance suspension with ideal front and rear balance. Its premium FOX shocks have been recalibrated to improve ride control. It rests on an ultra-efficient, lightweight chassis. That fully welded steel chassis, which measures a whopping 18 inches (45.7 cm) longer than the competition, delivers superb stability and performance through optimized handling. Ample braking, next-generation Dynamic Power Steering, abundant traction and strategic design also enhance the driving experience. 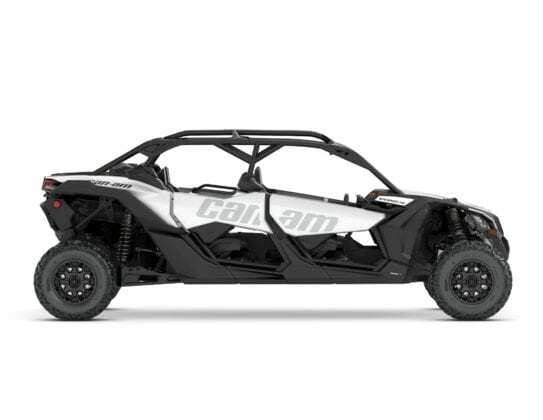 The Can-Am Maverick X3 MAX X rs Turbo R side-by-side vehicle features 22 inches (55.9 cm) of suspension travel, which leads its class. 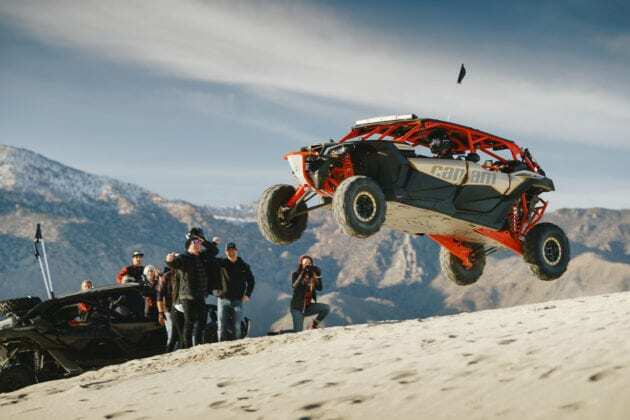 The four-link TTX suspension has a trophy truck-like trailing arm and three links that control wheel toe for optimal geometry during extra high wheel travel. Components are perfectly matched for unparalleled power transfer to the wheels with virtually no bump steer. The suspension system also offers precision control, traction and more confidence at higher speeds. The Can-Am Maverick X3 MAX X rs Turbo R side-by-side vehicle features 22 inches (55.9 cm) of suspension travel, which leads its class. 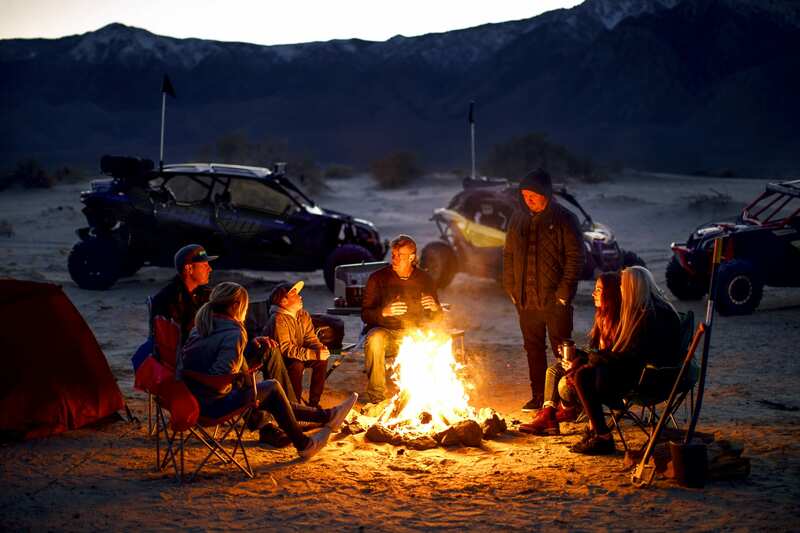 The Maverick X3 MAX Turbo R and X3 X ds Turbo R vehicles have a very comfortable and capable 20 inches (50.8 cm) of rear suspension travel to enhance the off-road riding experience. The Can-Am Maverick X3 MAX X rs Turbo R vehicle has a trophy-truck inspired front architecture with an arched double tubular A-arm and sway bar. The setup significantly increases ground clearance [total of up to 14 inches (35.6 cm)], approach angle capacity and also supplies 22 inches (55.9 cm) of travel. The Maverick X3 MAX Turbo R and X3 X ds Turbo R packages have 20 inches (50.8 cm) of travel up front. 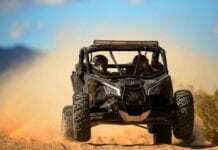 There are three different shock options depending on the Can-Am Maverick X3 MAX package, but all have features ready for competitive situations. The Maverick X3 MAX side-by-side vehicle comes with recalibrated FOX 2.5 Podium HPG Piggyback shocks with front and rear QS3 compression adjustment and rear bottom-out control for a quick and easy set up. The Maverick X3 MAX X ds features recalibrated, fully adjustable FOX 2.5 Podium RC2 HPG Piggyback shock with front and rear dual-speed compression and rebound adjustments, as well as rear bottom-out control to give the driver flexibility to fit the terrain and preferred driving style. The top-of-the-line Maverick X3 MAX X rs package also receives recalibrated shocks. It features fully-adjustable FOX 2.5 Podium RC2 HPG Piggyback shocks with bypass and dual-speed compression and rebound (front), and class-leading FOX 3.0 Podium RC2 HPG shocks with remote reservoir and bypass, paired with dual-speed compression and rebound adjustments (rear) for ultra-precise performance. 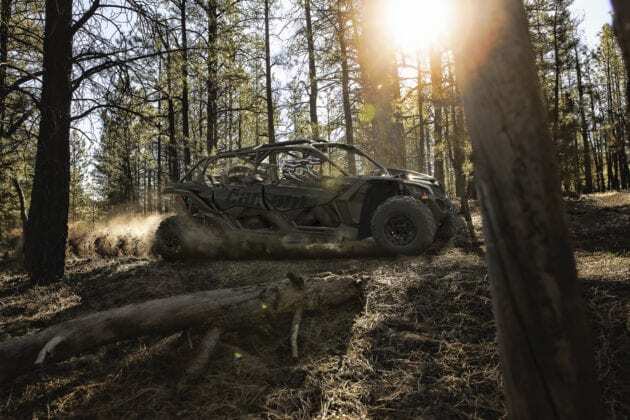 The Can-Am Maverick X3 MAX side-by-side vehicle, like its two-seat Maverick X3 brethren, features an ultra light, rigid chassis made of state-of-the-art Dual-Phase 980 steel. It is strong enough to allow the suspension to perform its magic at speed, while efficiently harnessing the 154 horsepower Rotax engine and also keeping passengers locked in to experience the ride. The Can-Am Maverick X3 MAX side-by-side vehicle’s cage is also made of state-of-the-art Dual-Phase 980 steel, which is extremely light and rigid. It is a 1.85-inch (4.7 cm) tubular, fully welded design – no bolts, no extra pieces – with dedicated servicing zones in case of repair or replacement. It is fully ROHVA compliant and creates a protective barrier around both driver and passenger. 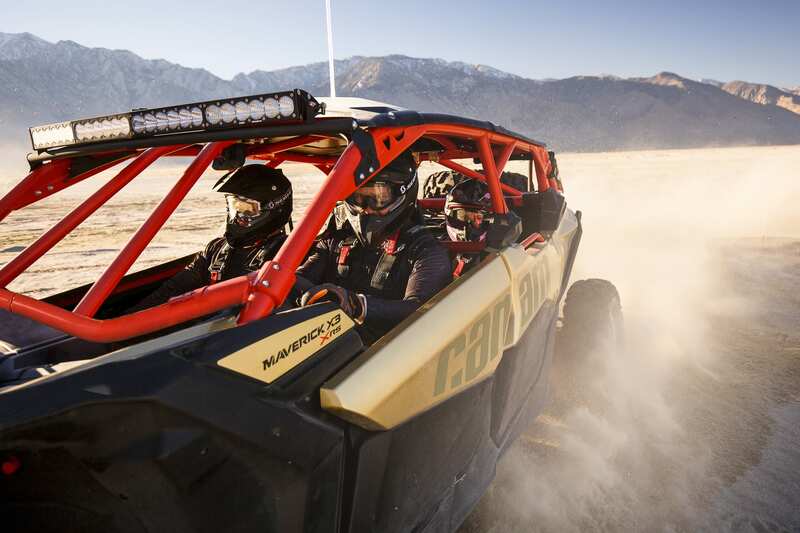 The Can-Am Maverick X3 MAX vehicle offers increased protection for all occupants. In addition to its unyielding cage, it comes standard with an integrated front bumper, quarter-doors and full HMW (high-molecular weight) polyethylene skid plate. The Maverick X3 MAX X rs side-by-side vehicle also has a full roof and a thicker heavy-duty HMW skid plate for enhanced protection. The 135-inch (342.9 cm) wheelbase, which is a full 18 inches (45.7 cm) longer than the closest competitor, improves off-road capability by supplying more comfort and a confidence-inspiring ride at higher speeds. The extended wheelbase, optimal weight distribution (44% / 56%) and ample ground clearance [up to 14 inches (35.6 cm)] creates optimum performance and stability in even the most challenging terrain. 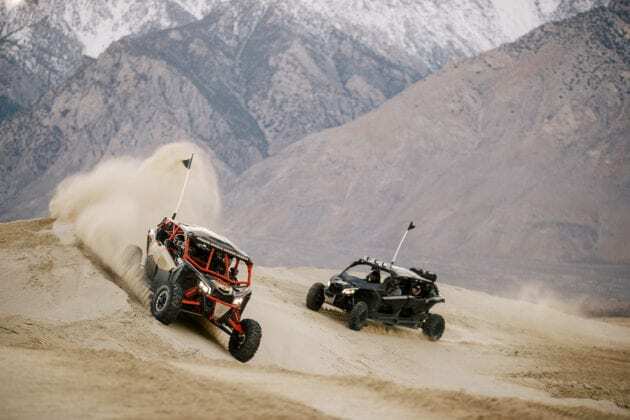 The 8-inch (20.4 cm) broader stance on the 72-inch (182.9 cm) wide Maverick X3 MAX X rs Turbo R vehicle also provides favorable stability, when combined with its superior shocks and longer chassis. The Can-Am Maverick X3 MAX wears 14-inch (35.6 cm) aluminum wheels. A 14-inch (35.6 cm) aluminum beadlock option is available with the X packages. The mechanical fastening beadlock system makes it nearly impossible for the tire bead to break loose from the wheel during heavy acceleration or cornering. The Maverick X3 MAX packages offer three different six-ply Maxxis Bighorn 2.0 tire sizes: 28-inch / 71.1 cm (X3), 29-inch / 73.7 cm (X3 X ds) and 30-inch / 76.2 cm (X3 X rs). The versatile tires offer sturdy lugs and a non-directional tread pattern for a smoother ride and superior grip over a variety of terrains. The Can-Am Maverick X3 MAX vehicles all have the same braking package for superior stopping performance. Front and rear twin piston calipers and 262 mm front discs provide ample stopping performance. Each has high-performance brake pads for superior control. Also beneficial is the master cylinder being located inside the cockpit for better protection. 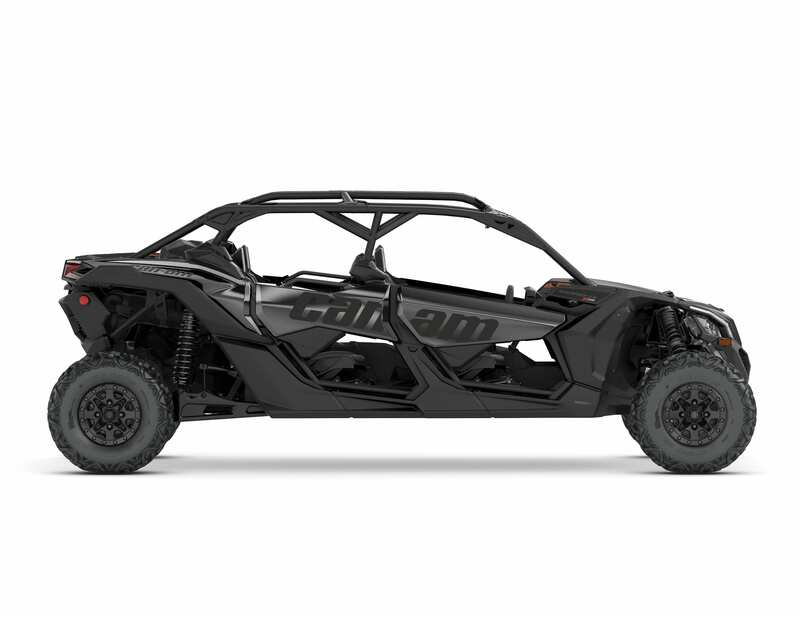 The Can-Am Maverick X3 MAX side-by-side vehicle has many driver-centric features. It has a race-inspired, quick-ratio steering wheel with just 1.5 turns lock-to-lock. There are also two driving modes (Eco, Sport) and a new, next-generation Tri-Mode DPS system (Min, Med, Max) designed to optimize the desired amount of steering assist for varying conditions. All Maverick X3 MAX models come with Intelligent Throttle Control (iTC™) that provides smooth throttle delivery even if the driver’s foot is bouncing in rough terrain. Can-Am Maverick X3 MAX side-by-side vehicle comes with a 10.5-gallon (40 L) fuel tank, which is the largest in its class, meaning more time can be spent riding and less time spent refueling. 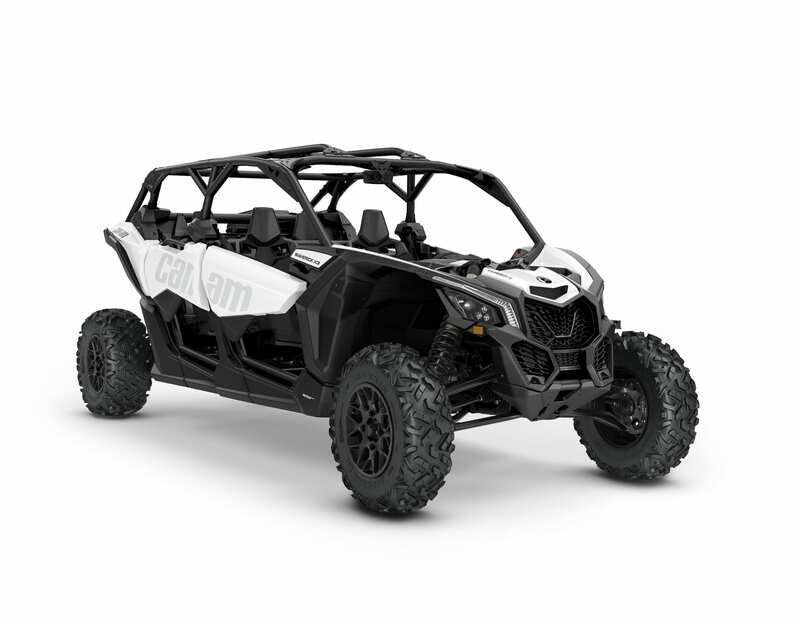 The Can-Am Maverick X3 MAX side-by-side vehicle offers a total of 3 gallon / 11.4 L of storage by way of a fixed glove box, two center console and four cup holders, because added convenience improves the overall performance package. The rear rack has a 150-pound (68 kg) capacity and is designed to work with the Can-Am LinQ quick-attach accessory system, allowing easy installation and removal of a storage box, rack extension, bag or other items. The centre console includes a lighter-type DC outlet as well. 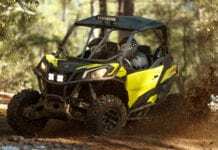 The Can-Am Maverick X3 MAX family features an automotive-like, keyless start-stop button activated by a Radio Frequency Digitally Encoded Security System (RF D.E.S.S.) key. It also includes a separate learning key that limits speed and acceleration for novice drivers. 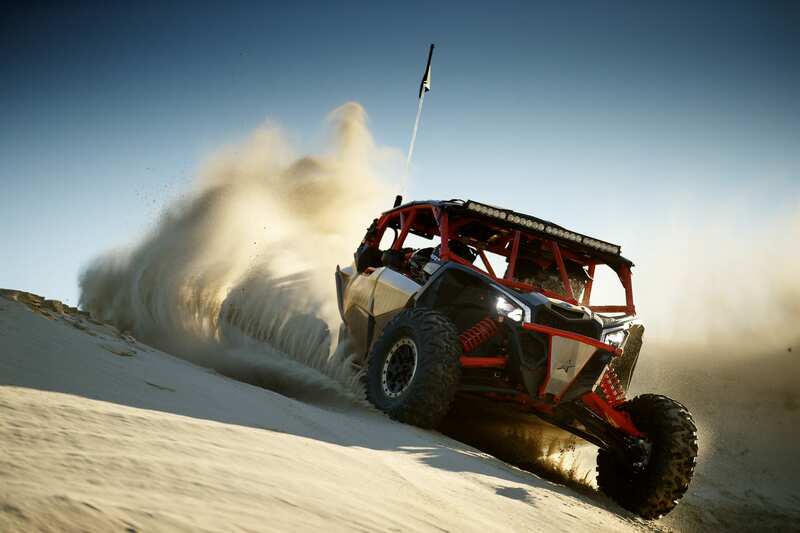 Can-Am engineers designed the vehicles to be easy to maintain. The front hood allows quick access to fluids and fuses, while snap-fitted body panels allow for quick access to other key components. The hood and grill are also removable for easy radiator cleaning. Additionally, there is easy access to DIY pieces, including the radiator, battery, oil filter, fuel pump and turbo. 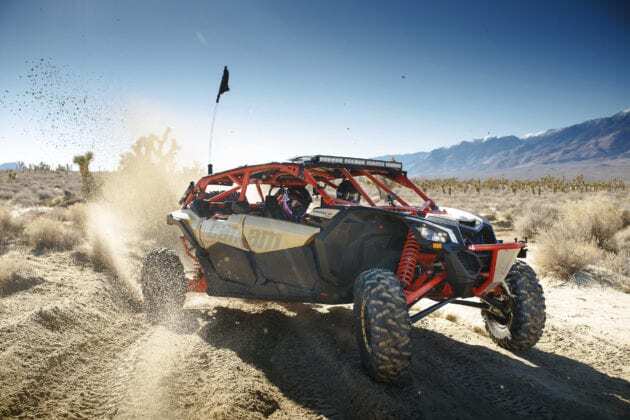 The Can-Am Maverick X3 MAX side-by-side vehicle has no break-in maintenance required and only an annual maintenance schedule, which means reduced total maintenance costs. The yearly advised maintenance is at 1,865 miles (3,000 km) or 200 hours. 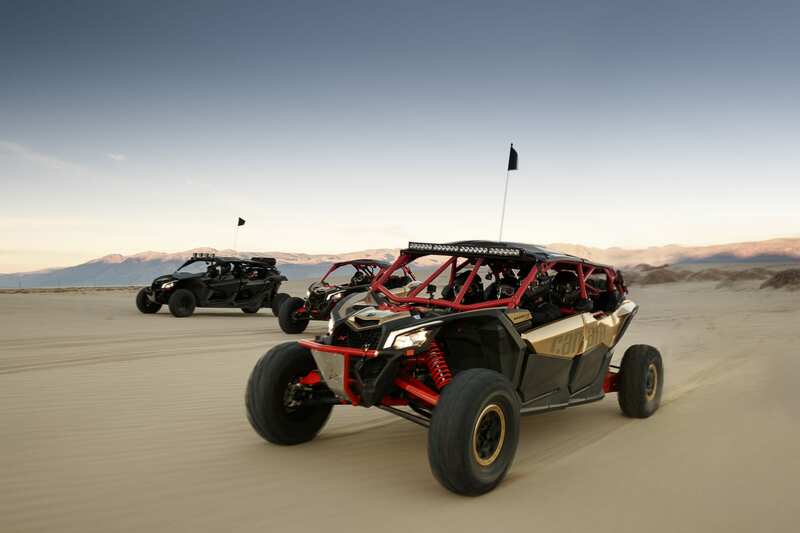 The Can-Am Maverick X3 MAX side-by-side vehicle is powered by the incredible 154 hp turbocharged and intercooled Rotax ACE engine found in the two-seat Maverick X3 vehicles. The same advanced airflow dynamics and performance-tuned QRS-X CVT transmission and sport-tuned exhaust work in unison to give it an edge over the competition. 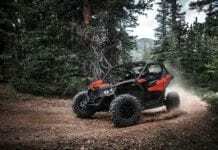 The Can-Am Maverick X3 MAX side-by-side vehicle has an incredible 154 hp at 7,500 RPM and 113 lb-ft of torque at 7,000 RPM. Power comes from an inline triple-cylinder, turbocharged and intercooled Rotax ACE 900 cc engine. The hearty power plant is located in the rear of the chassis, resulting in lower cockpit noise, vibration and heat. It also has iridium spark plugs, which provide improved combustion, longer life and lower maintenance. The Can-Am Maverick X3 MAX family has a light and durable intercooler optimized for maximum cooling efficiency. Its large fan and optimized placement are engineered for performance without compromising visibility. An integrated Rotax turbocharger with high boost is located right next to the engine for an immediate power delivery. It’s built for performance, but its one-piece turbine housing and exhaust manifold also offer more durability. 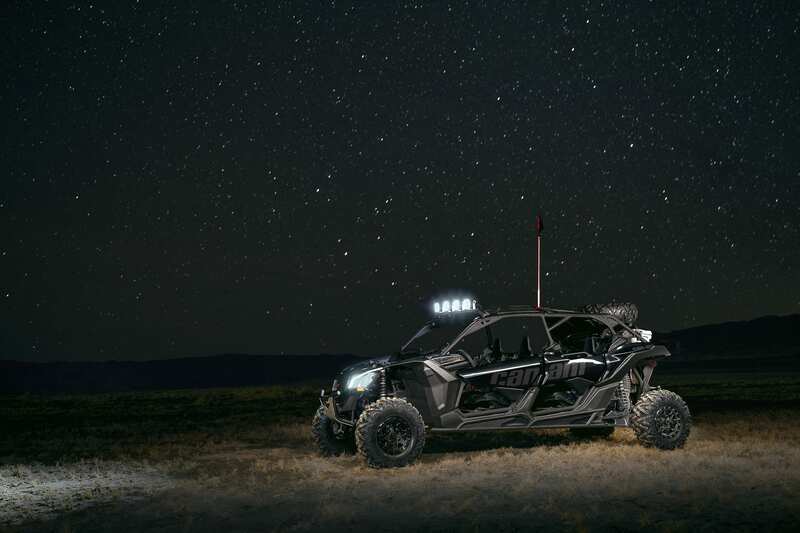 The Can-Am Maverick X3 MAX side-by-side vehicle’s high-output, 650-W magneto can handle additional power demands like extra lighting or a pulse-pound speaker setup. The Can-Am Maverick X3 MAX side-by-side vehicle features a highly efficient airflow system that’s optimized from intake to exhaust to deliver superb engine efficiency and performance. The intake areas are strategically positioned high and dry for excellent mud/ water protection. There are three oversized air intakes located behind the driver that deliver a constant supply of clean air – two to cool the CVT and one for high airflow to the engine. The Maverick X3 MAX also features an easy-to-access, long-lasting Donaldson air filter that’s purpose-built for performance. The Can-Am Maverick X3 MAX vehicle’s turbine housing is integrated with the exhaust manifold, providing better airflow and minimizing pressure drop so the turbo has no lag. The large, sport-inspired exhaust has a unique and powerful sound signature, which only a Rotax 3-cylinder engine can deliver. The Can-Am Maverick X3 MAX side-by-side vehicle has a high-performance QRS-X CVT transmission in a compact gearbox that’s optimized to work in combination with the turbo to virtually eliminate turbo lag and enhance throttle response without torque interruption. It has a smooth and predictable engagement, and stays at an optimal RPM so the focus can be on driving and overall performance, even in the most severe conditions like hill climbing or muddy terrain. 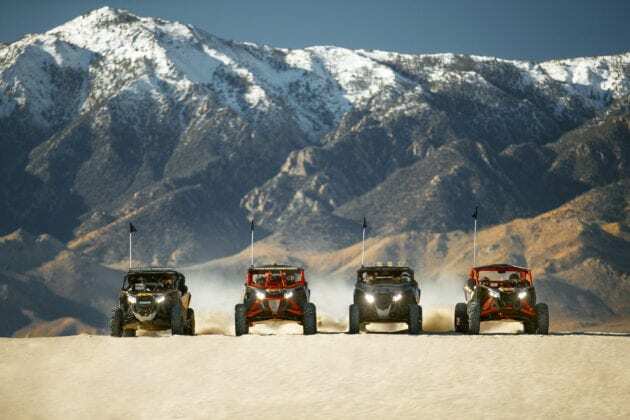 The QRS-X CVT transmission converts the Can-Am Maverick X3 MAX family’s thrilling power into extreme capability with a long, wide, thick drive belt and a robust three-roller pulley design that includes integrated cooling fins for enhanced airflow. It is a gear-on-gear system with no rear prop shaft for more durability and no maintenance required. The Can-Am Maverick X3 MAX side-by-side vehicle features improved airflow for optimized CVT cooling which provides better protection for longer-lasting CVT components (e.g. longer belt durability) and less maintenance. The Can-Am Maverick X3 MAX side-by-side vehicle was designed for ease-of-maintenance with the transmission system by way of quick access to the filters, an easily removable CVT belt and easy-to-access CVT cover drain plug. 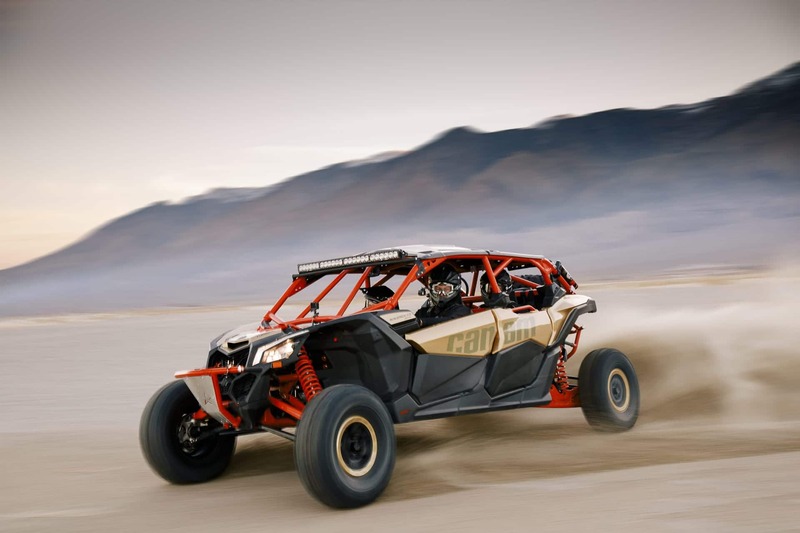 The bold Can-Am Maverick X3 MAX side-by-side vehicle brings new levels of passenger comfort and ergonomics, while at the same time delivering astounding all-around performance and unquestionable charisma. 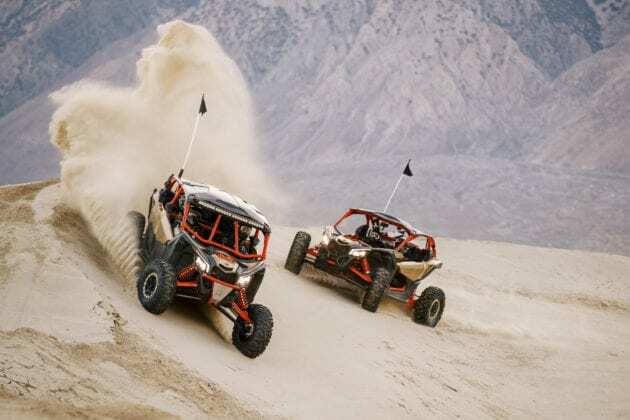 With its astonishing turbocharged 154-hp Rotax ACE engine, performance-tuned transmission, best-in-class suspension and high-rigidity chassis, the Can-Am Maverick X3 MAX side-by-side vehicle easily separates itself from a crowded field. Sport-driving enthusiasts and off-roading families can now escape the mundane together in one legendary vehicle, thanks to the spacious cockpit, new levels of ergonomic accommodations and a bevy of authentic accessories. An already proven Maverick X3 family design now offers an enhanced multi-passenger intuitiveness by being able to provide seamless connectivity for up to four occupants, allowing everyone to unleash their inner Maverick.